Click/tap highlighted track names for full Soundtrack release info. Composers are linked if they worked on other featured movies. Craig Safan, who composed this massive symphonic work, did a excellent job. 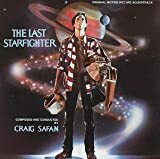 Like John Williams, the composer for Star Wars, Craig made "The Last Starfighter" a memorable treat. It's no secret that Safan was specifically asked to do a copy of the Star Wars music formula. Lucky for 80's film music fans, he achieved so much more. Jump To: The Juicy Trivia!